I love this recipe for a number of reasons — rich flavor, tender chunks of beef to name two — but its versatility is what I’m really craving lately. Though still delicious unadorned, each bowlful takes on a whole new personality depending on what you choose to toss on top. In other words: It’s a great way to please all types of palates. Set out a variety of goodies — corn chips for crunch, cheese and sour cream for creaminess, jalapeños for extra heat…I think you get the idea — to make a DIY chili bar that works just as well For dinner with family as it does for your next Super Bowl party. 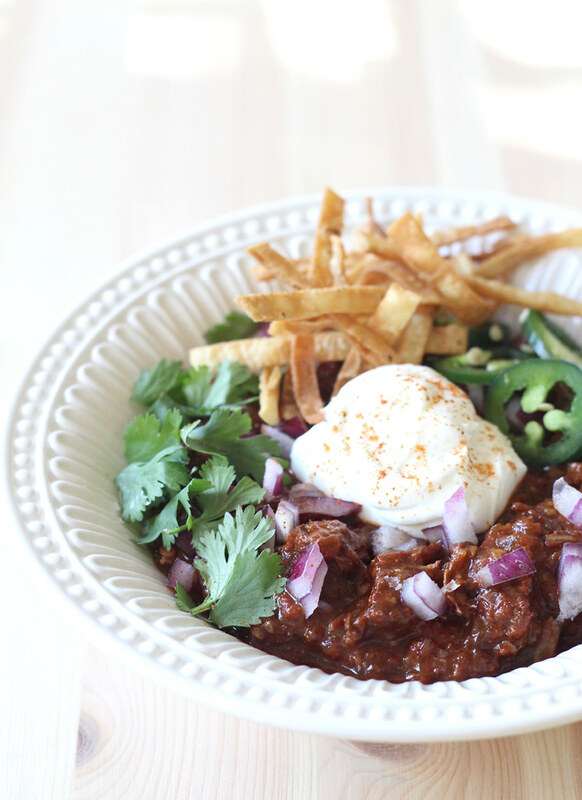 What goes into your favorite type of chili? (Beans? Tomatoes? Type(s) of meat?) Let’s talk in the comments or on Facebook! Heat 4-quart stock pot over medium-high heat. Toast peppers until darkened and beginning to soften. Add broth and bring to a boil. Remove from heat, cover and let soak for 30 minutes. After peppers have softened, transfer the entire mixture (peppers plus cooking liquid) to a blender or food processor (if the mixture is still warm, the top cannot be completely covered unless you want an explosion to occur — I just hold several layers of floursack towel over the small, center hole). Blend peppers until smooth; set aside. Preheat oven to 325°F. While peppers soften, warm oil in a large Dutch oven over medium-high heat. Sear beef for about 1 – 2 minutes, stirring every 30 seconds or so, until browned on all sides. Remove to a heatproof plate. Reduce heat to medium, and add onions. Cook, stirring occasionally, until softened and browned in spots (about 8 minutes). Add garlic through Kosher salt and 1 teaspoon of the cayenne, and cook, stirring constantly, until fragrant and just beginning to brown (about 1 – 2 minutes). Deglaze pan with beer, and return beef and accumulated juices to pot. Increase heat to high and bring to a boil. Once boiling, add pureed pepper mixture to pan and return to boil. Remove from heat, cover and place in the center of the preheated oven for 3 hours or until beef is tender and liquid reduced. Season to taste with remains teaspoon cayenne (if desired) and Kosher salt. Serve chili hot with a selection of garnishes for topping. Leftover chili can be cooled, packaged up and refrigerated for several days or frozen for several months. Reaheat gently in the microwave or over low heat on the stovetop. ¹ I used Shiner Bock (contains gluten) to keep it even more Texan, but Omission Lager (gluten-free) is another great choice.